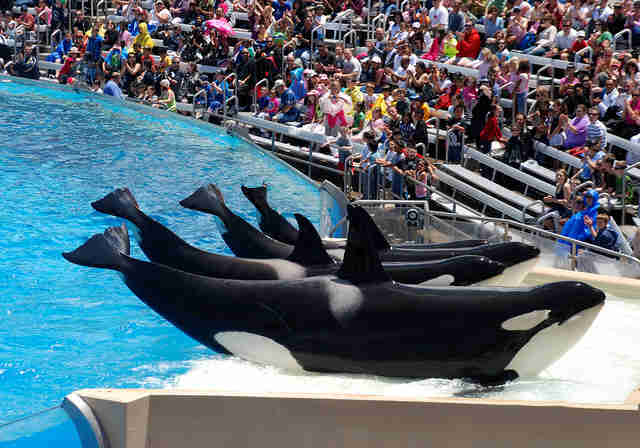 The ink has barely dried on SeaWorld's welcome decision to end its breeding program, but the company is once again twisting the facts. Earlier this month, SeaWorld announced it would no longer breed its orcas, meaning the 24 orcas currently in its care would likely be the last generation. 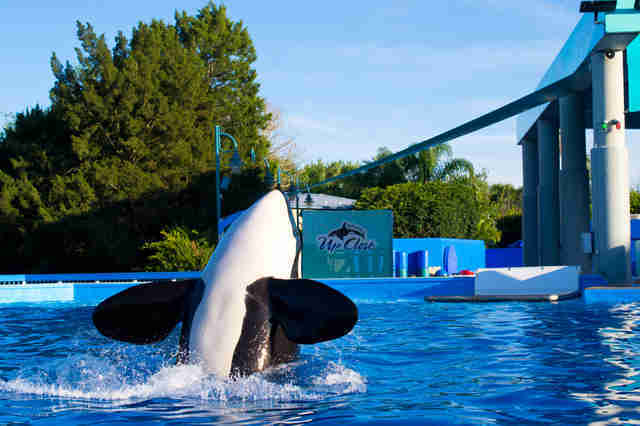 However, while the decision was heralded as a step in the right direction, people quickly questioned whether SeaWorld would take the logical next step and release its orcas to a sea sanctuary. SeaWorld was quick to shut those questions down - and make clear that the company would keep its orcas in their tiny tanks as long as it could. "Critics want us to go further; they believe we should simply 'set free' the whales and release them into the ocean," SeaWorld said in a statement titled "Why Sea Cages Are Dangerous." "We believe that would likely be a death sentence for our whales." Unfortunately, as usual, SeaWorld's latest PR spin isn't quite accurate. For one, far from calling for the orcas' release into the wild, most legitimate biologists and animal welfare advocates would agree with SeaWorld. The park's whales are far too "messed up" to be fully released, said Dr. Naomi Rose, Ph.D, a marine biologist and orca expert with the Animal Welfare Institute. Rose told The Dodo that, after being raised in SeaWorld's unnatural environment, many of its orcas are too damaged to ever live on their own in the wild - and it's unlikely that they could be trained to survive on their own. "We're pretty crappy orcas," she said of humans. "And the idea that we could train an [captive-bred] orca to be an orca is pretty arrogant of us." Rose, like others in the orca welfare community, believes that sea sanctuaries, or fenced-off pens in the ocean, would be the next best thing. They would allow the orcas to have access to things they've grown dependent on in captivity - medical care, prepared food - while having more room to swim and regaining part of the lives that nature intended. But SeaWorld said that the sanctuaries - which its PR team rechristened "sea cages" - "would be as dangerous for the whales as simply releasing them into the ocean, and could in fact be worse. 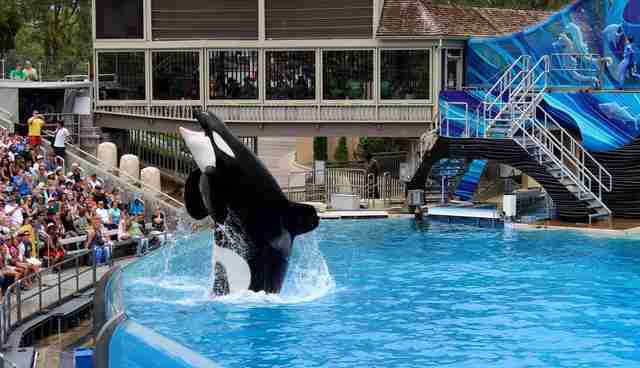 "Stuck in these cages, they would be helpless to avoid contagious diseases, parasites and pollutants," SeaWorld said. "They would be sitting ducks, stuck in one place no matter what the tide brings in, whether it's an oil spill or a hurricane." Rose doesn't buy that claim. "The idea that sea pens in and of themselves are dangerous is utterly ludicrous," she said. While Rose said that setting up sanctuaries would have to be done carefully - taking into account water quality and location, as well as the health of the orcas - she noted that SeaWorld used to move its whales around extensively and that, in her opinion, the benefits would far outweigh the risks. While SeaWorld's orcas have been subjected to a host of welfare issues, one of the biggest is their lack of space. While orcas can easily swim 75 miles per day in the wild and dive hundreds of feet below the surface, SeaWorld's orcas are packed into tanks just a few body lengths long. The overcrowding - both among the orcas and other animals like dolphins and belugas - has led to some of the most violent animal incidents, including orcas ripping strips of skin off each other, animals pushing each other out of their tanks and fights that have even turned fatal; one orca, Kandu, broke her jaw when violently ramming a tankmate in the 1989. She severed an artery and died spurting blood from her blowhole while her infant daughter circled, panicked, around her. And leaving SeaWorld's two dozen whales - including a calf about to be born - to live in these conditions for what could be another 40 years seems like a much crueller "death sentence" than moving them to sea sanctuaries. "It's not something to be done lightly. I agree with them on all those points," Rose said of the move to ocean pens. "The fact that it would be a death sentence? That's ludicrous. They have no data to support that." And while SeaWorld says that it would be impossible to transfer orcas to sea sanctuaries because "sea cages for orcas do not currently exist anywhere in the world," the park ignores the fact that sea sanctuaries are hardly a new concept. Rose noted that the U.S. Navy's Marine Mammal Program keeps its trained dolphins in sea pens just down the coast from SeaWorld San Diego. In another bit of pro-captivity spin, SeaWorld mentions the case of Keiko, an orca who was captured as a calf in 1979 and returned to the ocean in the late 1990s after being freed from a Mexican amusement park. "Never in the history of mankind has an orca born under human care survived a release to the wild," SeaWorld says. "Even though Keiko was born in the wild and millions were spent preparing him for release, after being released he died from pneumonia and starvation. 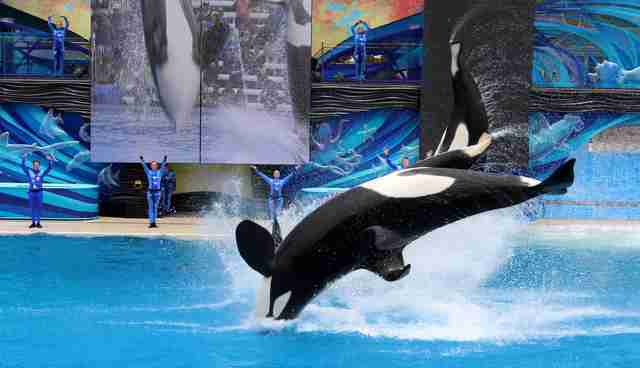 We're not going to take this risk with SeaWorld's whales." Again, SeaWorld falsely conflates release to a sea sanctuary with a release into the wild. 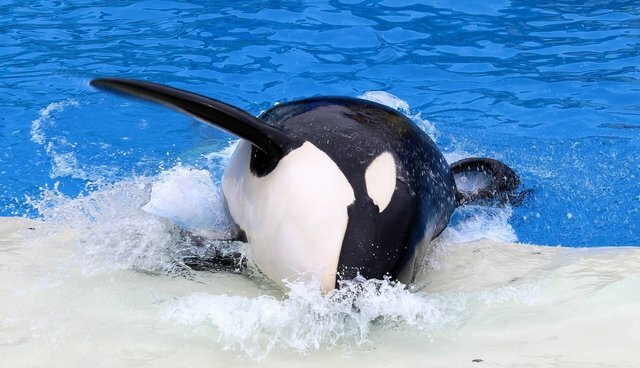 But even then, Rose noted, Keiko lived for several years in the ocean before he passed away - despite SeaWorld's strong opposition to the move at the time. Keiko was also close to his natural average lifespan when he died, and was in the open ocean and not a sea sanctuary, so it's impossible to draw conclusions about the safety of sea sanctuaries from his story, she explained. She also noted that SeaWorld's new statement on sea pens is more than a little self-defeating. "This is the hypocrisy that SeaWorld is claiming; they're claiming that their whales are good models for wild whales, and that ... you can do research on captive whales," Rose said. "Then they tell me, 'But if we dip them into the ocean they'll die.' That tells me they're models for nothing." SeaWorld, it seems, is just grabbing onto the argument that allows the park to make the most money of the whales with as little effort as possible - even if means contradicting itself. "The best, and safest, future for our whales is to let them live out their lives at SeaWorld, receiving the highest quality care, based on the latest advances in marine veterinary medicine, science and zoological best practices," SeaWorld said. Of course, SeaWorld was just as adamantly opposed to ending breeding days before they announced they'd be closing the program. And Rose, for one, isn't giving up hope that, one day, SeaWorld will be pressured into taking another step forward for its orca's welfare. "We damaged them; we have to care for them," she said of the orcas. "But they're going to be in a natural habitat with a lot more room to roam ... they'll have more to do ... it'll just be a more interesting life."